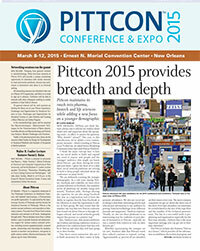 Pittcon maintains its reach into pharma, biotech and life sciences while adding a new focus on a younger demographic. NEW ORLEANS — DDNews pre-show features always aim to inform our readers about what’s new and important about the upcoming event—in effect, to answer the question, “Why should I attend?” This year, in this introduction, we’ve added a very contemporary measure—what’s trending at Pittcon 2015? To find out, we asked Senior Marketing Communications Specialist Marian Nardozzi.